Customers need solutions that truly offer the best mix of price/performance for business workloads. That’s why the debut of our next generation entry-level PowerVault ME4 Series storage array family is great news for SMB customers. Dell EMC’s portfolio ensures customers will always have the RIGHT solution regardless of business segment or workload. 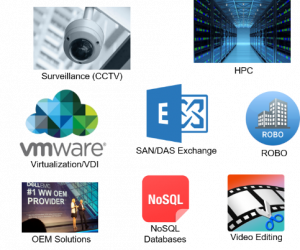 For the Entry Storage segment these workloads range from databases, VDI, backup to disk, to productivity applications requiring a solid SAN/DAS solution. This is what PowerVault ME4 Series was built for. In these highly competitive and resource-constrained environments, companies generally don’t get a second chance to make the right IT infrastructure decision – especially with data storage. At Dell EMC we have listened to our customers to ensure we provide a storage portfolio that’s clear and simple to understand, and the best solution for their needs. Simplifying our storage portfolio is a strategy we have been executing to. Dell EMC is already delivering on the first phase of this strategy with the enterprise-class PowerMax and today, we’re announcing the next step toward achieving that vision with the new low-cost PowerVault ME4 Series, our next generation entry storage solution purpose-built and optimized for SAN and DAS. As referenced by Dell Products & Operations President Jeff Clarke, we are committed to executing on this portfolio simplification strategy and continuous product innovation. The Dell EMC PowerVault ME4 Series is our most affordable SAN/DAS storage array with impressive performance and all-inclusive software. This new storage family comes with significant enhancements over current Dell EMC entry systems in capacity, performance, simplicity, and features. It includes the ME4012 (2U/12 drives), ME4024 (2U/24 drives) and the dense ME4084 (5U/84drives) base systems. With configurations starting under $13,000 (USD), PowerVault ME4 Series arrays are purpose-built and highly optimized for entry-level SAN and DAS environments that can be configured from 0 to 100% flash, expand to 4PB, drive up to 320K IOPs[i], and include all the software you’ll need to store, manage, and protect your data. Whether you’re taking advantage of PowerVault’s single-vendor DAS integration with leading Dell EMC PowerEdge Servers or connecting the ME4 Series arrays in a high availability SAN environment – you’ll be able to simplify the challenges of server capacity expansion providing business applications with reliable high-speed access to data. The built-in simplicity of the PowerVault ME4 recognizes the realities that smaller IT staffs are expected to manage a more diverse set of IT infrastructure solutions. As a result, “simplicity” requirements become essential in removing storage complexity with a “set it up and forget it” approach – whenever possible. In fact, we’ve done the testing and wrote the best practices for our customers so you will have every opportunity to be productive in the shortest amount of time. We’ve even included all the software features you’ll need to manage and protect your data as you drive your business forward – there’s nothing extra to buy or install. Best of all, ME4 arrays can be configured and ready for data center operations in 15 minutes with a new HTML5 web-based and intuitive interface for “anywhere” management. In addition to all-inclusive software, each ME4 array includes multi-protocol flexibility with options for Fiber Channel, iSCSI, and SAS host connectivity. In addition to driving up to 320K IOPs and supporting 0-100% flash in any mix of SSDs and HDDs, PowerVault ME4 Series comes standard with a 12G SAS backend for performance at scale and implements advanced SSD Read Cache technologies – all optimized to maximize your storage performance and efficiency. 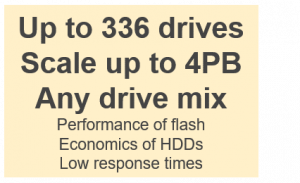 The intelligent ME4 Series caching capabilities help accelerate the speed of any application type or data access that businesses depend on. Since no one can predict if or when disaster will occur, protecting critical data and preventing data loss should be the first rule of any IT organization since data is the lifeblood of all companies – regardless of their size or industry. Equipped with snapshots and asynchronous multi-site FC and IP replication capabilities, PowerVault ME4 arrays reliably deliver data protection and disaster recovery options for customers to achieve the recovery time objectives (RTO) and recovery point objectives (RPOs) that their business demands. The new PowerVault ME4 Series is just more evidence of our long-standing commitment to innovation. The PowerVault ME4 represents the quintessential entry-level storage product that accelerates and supports business growth while helping to reduce cost and remove operational complexity. This new storage family has been developed with a “set-it up and forget-it” approach, flexible scale and connectivity options, cloud-like management simplicity, and a very impressive price/performance ratio. IDC’s Q2CY18 Worldwide Quarterly Enterprise Storage Systems Tracker ranks Dell as the leader in the External Entry Storage Market with a 31.6% revenue share – larger than the next six competitors combined[i]! We’re #1 because we’ve consistently been investing in this segment of the storage market with innovative technologies and products that customers of all sizes have been purchasing and using for many years. This commitment continues with PowerVault ME4 Series. Recall from above what I’ve heard from customers – they have the same needs as large enterprises, but have to meet business goals with significantly smaller budgets and IT staffs. We can confidently say that the new PowerVault ME4 Series will affordably deliver what our customers need and without them having to make compromises with their business. So please take a moment to discover the new PowerVault ME4 Series and join Dell EMC as we help organizations of every size push beyond the boundaries of legacy IT, compete strongly in their industries and realize better business outcomes. Next articleIs NYC’s garment district unraveling?